The Minister of Defense of Azerbaijan, Colonel-General Zakir Hasanov met with a delegation led by Deputy Assistant Secretary of Defense of the United States Laura Cooper on December 4. Welcoming the guests, the Minister of Defense noted the successful development of military relations between the two countries and outlined the military cooperation between Azerbaijan and the U.S., including the activities of the Azerbaijani soldiers in the framework of NATO programs, as well as the participation of the Azerbaijani peacekeepers in Afghanistan. The Minister stressed that both countries are interested in expanding cooperation in the military, military-technical and military-educational spheres. Colonel-General said that it was decided to increase the number of Azerbaijani officers studying in advanced military educational institutions of the U.S.
Informing the guests about the military-political situation in the region, the Minister of Defense emphasized that Armenia, which poses a threat to stability in the South Caucasus, despite the norms and principles of international law, continues to occupy the territories of Azerbaijan. In turn, Cooper stressed that the U.S. government is interested in expanding and strengthening cooperation with Azerbaijan in the field of security and defense. Highly appreciating contribution of Azerbaijan to operations in Afghanistan, including the professionalism of Azerbaijani peacekeepers, Cooper, quoting the words of U.S. Secretary of Defense James Mattis, noted that "the successes achieved today in Afghanistan would have been impossible without the active support of Azerbaijan." The guest highlighted the participation of Azerbaijan in the fight against terrorism and the exemplary service of peacekeepers in Afghanistan. 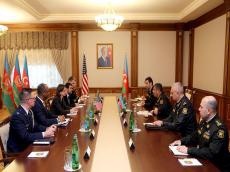 During the meeting, the sides discussed prospects for the development of military relations between Azerbaijan and the U.S., in particular, cooperation in the field of security and defense, as well as issues of military education and medical training.